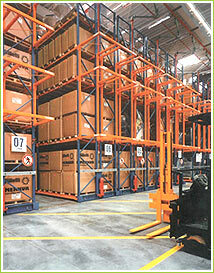 MOBILE PALLET RACKING is a high-density system designed to provide maximum accommodation with maximum availability. The racking runs are mounted on mobile bases which move on floor-mounted rails. The bases are electrically driven and electronically controlled to provide access to the required aisle.